Pune, Noida, Bengaluru, Chennai, Hyderabad, Kolkata and Ahmedabad witnessed a decline in sales as well as launches, while only two cities, Mumbai and Gurugram, saw a rise in demand and supply. Housing sales dropped 18 per cent year-on year to 44,755 units in nine major cities during the September quarter on continued slowdown in the property market, a report said on Thursday. 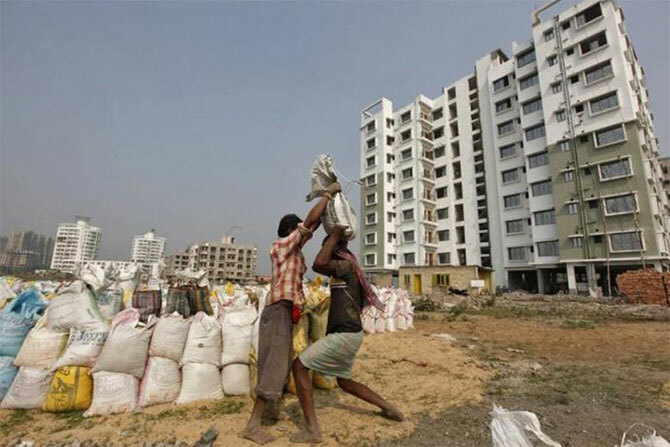 New launches of homes fell by 53 per cent to 22,115 units in the second quarter of the current fiscal due to the implementation of new real estate law RERA, said the report by realty portal PropTiger.com. It said seven cities -- Pune, Noida, Bengaluru, Chennai, Hyderabad, Kolkata and Ahmedabad -- witnessed decline in sales as well as launches, while only two cities, Mumbai and Gurugram, saw a rise in demand and supply. News Corp-backed PropTiger.com is part of Elara Technologies, which also owns Housing.com and Makaan.com. "The new RERA and GST regime impacted launches as well as sales in the second quarter of FY18. However, sales showed a marked improvement in September over July and August, driven by festival offers launched by most developers," said Ankur Dhawan, chief investment officer, PropTiger.com. Ahmedabad saw the maximum fall in sales of 46 per cent to 2,222 units in the July-September quarter of 2017-18, over the year-ago period. The decline in sales in Pune was 32 per cent to 7,214 units, followed by Noida 29 per cent to 3,606 units, Bengaluru 27 per cent to 6,976 units, Chennai 23 per cent to 2,945 units, Kolkata 21 per cent to 2,993 units and Hyderabad 18 per cent to 3,356 units. However, housing sales in Gurugram rose by 60 per cent to 3,342 units. Mumbai saw 6 per cent rise in sales to 12,101 units during the second quarter of this fiscal. "Due to improved buyer confidence, Mumbai and Gurugram recorded an increase in sales by 6 per cent and 60 per cent respectively over Q2 FY’17," PropTiger said. Mumbai and Gurugram also saw increase in launches by 19 per cent and 85 per cent respectively during the quarter under review. Home launches in Mumbai stood at 9,584 units and Gurugram 2,460 units. The other seven cities saw fall in new home launches in a range of 37 per cent to 92 per cent. "The key driver for increased new launches in Gurugram and Mumbai is the affordable housing launches under Haryana Affordable Housing Policy 2013 and timely implementation of RERA in Maharashtra," the brokerage firm said. According to the report, RERA, though applicable since May 2017, was not implemented in many key states such as Karnataka, Haryana, Telangana, Uttar Pradesh till the middle of July 2017 which had a major impact on new launches. "Though the last quarter looks sluggish, the long term story for residential market remains strong. With effective implementation of RERA, we expect growth of 30 to 40 per cent on year on year basis in sales and new launches in the next quarter," Dhawan said. Want to withdraw your PF to buy a home?